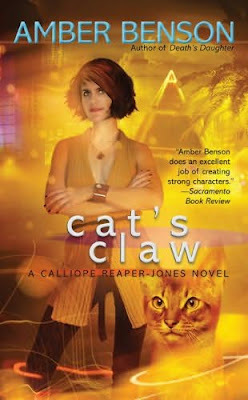 Don't know how final this is, but here is the cover for Cat's Claw by Amber Benson, the second book in her Calliope Reaper-Jones urban fantasy series. The book releases February 23, 2010. Oops if you look closely there are more swirly light-thingies. 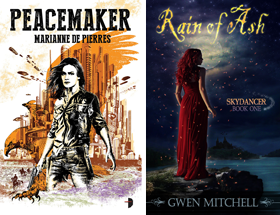 What's with all the swirlies on book covers lately? hmm..I don't know if I like this cover. I really liked the first book and am really excited for the second but that cover looks..I don't really know. I hope they tweak it some more. umm, i haven't read the first one yet but I really hate this over. UGLY UGLY UGLY. Hope they rethink. Also I couldn't get passed the first 2 chapters in the first book, so I won't be picking this one up. Book Lady it does seem to have a bit of an unfinished look to it. All of the visual elements don't really gel. Hagelrat we'll see but don't hold your breath.